Prenocephale was a herbivorous (plant-eating) dinosaur that lived during the late Cretaceous period, about 83 to 65 million years ago, in Mongolia, as well as, possibly, North America. It was one of the dinosaurs that died out in the Cretaceous-Tertiary extinction, 65 million years ago. Prenocephale was generally similar in form to one of its close relative, Pachycephalosaurus, but was considerably smaller in size. Like Pachycephalosaurus, it had a thick bony dome on its head with bony knobs and spikes. However, as compared to a number of other animals in this group, Prenocephale's dome was sloping, hence its name which means "sloped head". Although some scientists have argued that perhaps Prenocephale was an omnivore, it is generally believed to have been a herbivore (plant-eater). Prenocephale probably ate leaves and fruit, and may have been quite selective in its foraging. Only a limited number of fossils of Prenocephale have so far been found, most of which are skulls, although a few other bones have been found. Based on these, and comparison of its anatomy to its relatives, scientists believe that Prenocephale was about 8 feet (2.4 meters) long, and weighed something in the region of 290 pounds (130 kilograms). 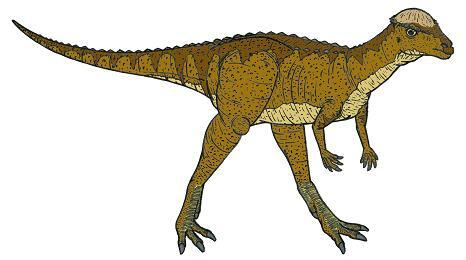 Asian Dinosaurs - Prenocephale lived in Mongolia, and possibly North America too. North American Dinosaurs - Prenocephale lived in Mongolia, and possibly North America too. Prenocephale was a genus of dinosaur. Prenocephale was a member of the Ornithischia ("bird-hipped") order of dinosaurs. What this means, is that although Prenocephale was not closely related to birds, it did have similarly shaped pelvic bones. Prenocephale was a Pachycephalosaur - a member of a group of related herbivorous (plant-eating) dinosaurs with bony domes on their heads. Prenocephale lived between about 83 million years ago and 65 million years ago, during the late Cretaceous period. Prenocephale was one of the dinosaurs which died out during the Cretaceous-Tertiary mass extinction at the end of the Mesozoic Era. Prenocephale was a herbivore (plant-eater). Prenocephale was about 8 feet (2.4 meters) long. Prenocephale weighed about 290 pounds (130 kilograms). Cute Dinos Journal - A 6x9" Size Journaling Notebook. Lined pages with medium ruled line spacing for easy writing. 130 writable pages. Lined pages without illustrations offering you maximum space to write. Writing with pen and paper helps to boost creativity. Helps to improve your memory. Helps to structure your thougths. Writing on paper is just as important now as it was 10, 20, 50 years ago. Maybe even more. Online media offer many distractions. It's so easy to quickly click or swipe. You might almost forget to just sit down and write down your thoughts, your list of things, draw or doodle whatever is on your mind. Many people talk about mindfulness, conscious living, but getting this notebook and taking time to write or draw helps to get some rest, to get grounded, to pace yourself. Writing by hand will increase your creativity. It helps you focus your energy and support your flow. Whether you are structuring strategic plans, organising your day, writing your next book, or jotting down your thoughts as a reminder, writing it down makes your creative juices flow. More and better ideas. Quicker and easier. Writing down your goals, actions and achievements helps to accomplish more, and to feel proud and successful of what you have achiveved. Feeling better. Besides, it has been scientifically proved that writing things down will increase your memory. Last but not least, writing down your experiences and reflections will help to process and manage emotions, and support self-improvement. (We suspect one journal will not be enough, for all the things you can do with pen and paper).